High tibial osteotomies are used to treat patients who have only one area of arthritis within their joint who are also bow-legged. A high tibial osteotomy can be used alone as a treatment for medial compartment osteoarthritis or to correct alignment in conjunction with other cartilage repair procedures. In order to determine if a high tibial osteotomy is an appropriate procedure for you, your surgeon will obtain a few different imaging studies. 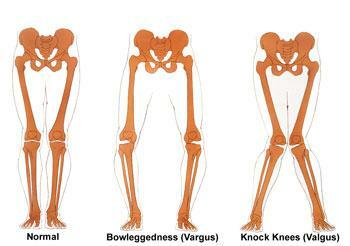 These studies will include regular x-rays, bone length films to determine your alignment, and possibly an MRI. Using these studies your surgeon will be able to calculate the angle he will need to use in order to correct your malalignment. High tibial osteotomies are most commonly used to treat arthritis in active patients who are still too young to have a joint replacement or whose activity level is such that they would damage or wear out an artificial joint prematurely. Our average patients who undergo high tibial osteotomies are males ages 45-55 with isolated medial compartment osteoarthritis. However, we do perform osteotomies in patients of both genders and all ages depending on medical need. Your surgery will be performed using either a general anesthetic or a spinal anesthetic depending on your and your surgeon’s preference. During your surgery, your surgeon will make a cut across the upper portion of your tibia (shin bone). The cut that is made will go almost all the way across the bone but will leave a small section of bone intact in order to create a hinge. Then using x-ray guidance your surgeon will open then hinge in your bone until your leg is straight and no longer bowed. Once the correct angle is achieved this will be fixed in place using a plate and screws. This plate and screws act similar to a cast that you would wear if you were to break your arm. The only difference is that the plate and screws can stay in your bone forever. Once your bone is well fixed and all of the screws are in place your surgeon will then put a material called Optium™ in the area of the cut. Optium™ is a bone putty that helps your bone to heal more quickly after surgery. Your surgical incision will then be closed using all subcutaneous or “dissolving” stitches. This means that you will not have any stitches that need to come out. Tibial tubercle osteotomies are used to treat patients who suffer from painful patellar maltracking. 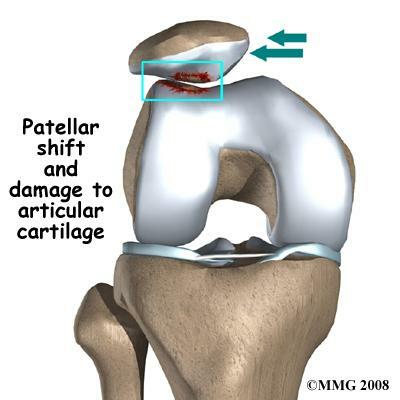 These patients may have had issues with patellar dislocations in the past. Often patients who suffer from patellar maltracking have chronic anterior knee pain. This is often manifested as pain with going up and down stairs and or sitting for prolonged periods of time. Tibial tubercle osteotomies are only effective in patients who do not yet have bone on bone osteoarthritis between their patella and femur (patellofemoral joint). Tibial tubercle osteotomies can be performed in conjunction with autologous chondrocyte implantation as an effort to treat both maltracking and cartilage damage caused by it. Your surgery will be performed using either a general anesthetic or a spinal anesthetic depending on your and your surgeon’s preference. During your surgery, your surgeon will make a cut across the upper portion of your tibia (shin bone). The cut that is made will be just behind what is known as the tibial tubercle. This is the area of your tibia where your patellar tendon attaches. Making this boney cut allows your surgeon to relocate your tibial tubercle to a more centralized location, thus correcting any maltracking. Once your tubercle has been repositioned it will be fixed back to your upper tibia using two screws. These screws act like a cast to hold the bone in place while it heals. These screws do not need to be removed. Some patients do find that they have some irritation from the retained hardware and in these cases, both screws can be removed during a day surgical arthroscopy. Once your osteotomy is completed your skin incision will be closed using all subcutaneous or “dissolvable” sutures. Your wound will be dressed and you will be woken up from anesthesia. 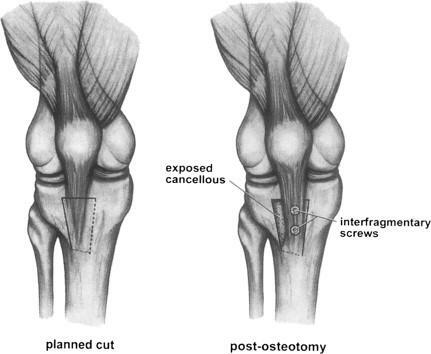 What can I expect post-operatively after an osteotomy? When you awake from surgery you will have a brace on your leg that will keep your leg straight. It will be important for you to wear this brace at all times when you are up and about. You do not have to wear your brace to sleep. You will also be given crutches. You will remain touch-down weight bearing for a period of 6-10 weeks. This means that you will walk with two crutches at all times putting only the weight of your leg on the ground for balance. You will also receive a CPM machine. This is a continuous passive motion machine that gently puts your knee through a preset ROM. This is designed to ensure that you do not get stiff after surgery and will be used for 4-6 hours per day. Depending on your surgeon and how you are feeling you will spend anywhere from 1-3 nights in the hospital. Do plan on spending at least one night. This is in order to make sure that you are comfortable and that your pain is well controlled. This time in the hospital also allows you to also meet with physical therapy and get some early exercise and crutch training. After surgery, you will also be on a blood thinning medication called Coumadin. This is done as a preventative measure for all of our patients to help prevent blood clots following surgical intervention. This will be managed by the Brigham and Women’s anticoagulation clinic. You will be required to take this medication for a period of 3 weeks times. When you go home from the hospital a visiting nurse will be coordinated for you to come visit you at home once or twice per week to draw your blood. These blood draws are important to managing your dosage of Coumadin. Immediately following surgery during your inpatient stay your pain will be controlled using IV pain medication. During your inpatient stay, one of the goals of your care will be to transition you from IV pain medication to oral pain medication. This is often achieved by day one or two after surgery. You will be sent home from the hospital with a prescription for oral pain medication to be filled at your local pharmacy. The most commonly prescribed post-op pain medications include Oxycodone, Dilaudid, or Vicodin. Most patients will require regularly scheduled doses of pain medication (every 4-6 hours) for the first two to three weeks. Following week three you will begin to decrease your pain medication use to prior to physical therapy and prior to bedtime. Most patients will not require any pain medication past week 6-8. You will be provided with detailed instructions on how to obtain pain medication refills from your surgeon’s office. This information will be provided to you with your surgical packet once a surgical date has been scheduled. It is important to know how to obtain your pain medication refills appropriately and in a timely manner.